In a very strange way, Matt Rhule’s introduction of a wildcat offense a year ago might be a nice starting point for new head coach Geoff Collins. While the biggest question going into the Notre Dame game could be who is going to start at quarterback, the prospect of Isaiah Wright coming out in the first series under center could probably throw off the Irish defense. Last year, Wright ran a rather muffled version of the Wildcat offense for a couple of series each game. We’ll call it The Mildcat. When the very talented runner came in the game, you could bet that he would carry the ball. If, though, Collins could jazz up the package with a pass or two–creating an equal threat and keeping the defense on its toes–that might work better for the Owls. People who watched in practice a year ago have related stories that Wright can throw the ball 65 plus yards on a dime. Unfortunately, we’ve never seen that in a real game. Maybe even on the first series. One thing is certain: The Owls are going to have to find a way to get the ball into Wright’s hands, either as a slot receiver, running back or Wildcat quarterback. They have an abundance of good receivers, so creating some package which has him throwing the ball more often might make the offense harder to stop and give him more holes to dart through in the running game. We’ve waited this long to find out who the starting quarterback will be. If Owl fans have to wait until the second series of the first game to find out the “true” starter, they would probably understand. 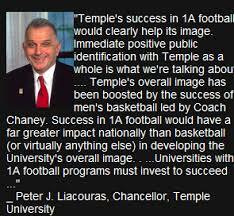 This entry was posted in Temple football and tagged Geoff Collins, Isaiah Wright, Temple football. Bookmark the permalink. He’s not afraid of the spotlight, and Isaiah is one of the few successful wildcat qbs I’ve ever seen because of his arm. It could be wright in several situations. Sat next to Isaiah’s mom at the 2016 AAC championship game . She was a sweetheart !! She’s an NFL mom and will be doing Campbell’s Soup commercials in a few more years. Wright is a very important weapon for Temple this year! We love Mr. Wright, he reminds me of someone as quick as the quickest we’ve seen at Temple in 20 years, Tarnardo Sharps. Does any one else remember the couple of time he connected on 40+ yards passes on a straight out speed pattern ? We need that level of talent again. Who were the QB’s for Tarnardo ? I forget, but I do remember a lot of near misses on those fly routes. Also, to all , be aware we are re-upping our season Tixx, I wasn’t sure due to personal business, but even if we miss 2 or 3 games we decided to continue to support the new Owls. And I am a band geek any way, Temple has some great band shows at half time and at the entry marches at the beginning always make me smile.